Even if you order up the healthiest menu items, the calories can rack up fast with a family-style meal. Use this trick: Fill up a plate with mostly veggies and lean protein; then add a small portion of starch, if you want. Not only will this give you a balanced meal, but it'll also help you to keep an eye on your overall food intake. If you go back for seconds, just stick with the veggies. It's not a myth: Begin a meal with broth-based soup, and you're likely to consume fewer calories overall. FYI: The Wonton Soup is a reasonable 120 calories. You can get these in an order of two or four, which is nice. But here's some need-to-know info: The dish of sauce that comes with it has another 100 calories! Skip that stuff and trade it for soy sauce, or just use it sparingly. Honorable Mentions: The standard or Orange Ginger Edamame (400 - 440 calories, 17 - 19g fat, Spicy Tuna Roll (280 calories, 3g fat, and California Roll (340 calories, 9g fat). All worthy apps! This sauced-up veggie dish is simple and tasty. 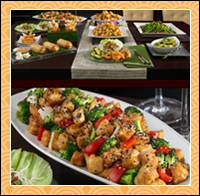 There's an option to get it stir-fried, which adds 120 calories and 4g fat to the dish -- why bother? 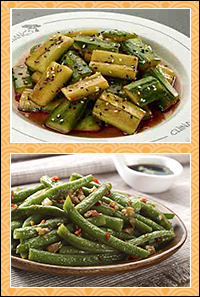 Here's a yummy stir-fried dish -- the ginger adds maximum flavor for minimum calories. And yay for broccoli! This take on a classic includes black beans, peas, mushrooms, and scallions. Love that! 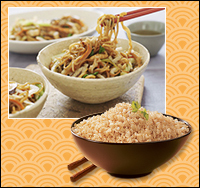 Rice is Nice... All entrées are served with a choice of steamed brown or white rice. We highly suggest going with the brown: a 6-oz. serving has 250 calories and 2g fat, and a bonus of 4g fiber. That fiber makes it much more filling than the white stuff. Now, we don't recommend overdoing it here, but keep your portion moderate, and you'll be all good. As we said before, steamed brown rice is the way to go -- just say no to fried versions. In terms of noodles, the Vegetable Lo Mein isn't terrible: 490 calories and 6g fat. But watch out... The Combo version has nearly TWICE the calories and nearly FIVE times as much fat. Swaparama: Click here to learn about the Dan-Dan Noodles (plus, a great recipe swap for them)! 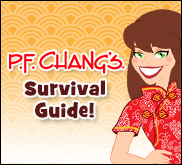 Help a Chinese-food-loving pal out -- click "Send to a Friend" to pass along this guide! The easiest, most guilt-free way to celebrate National Cherry Pie Day, which is today, February 20th? This microwave recipe.